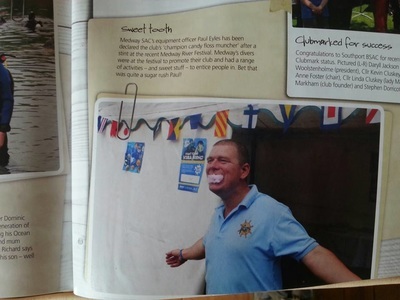 Three of our club members recently went to the Diving training College in York. The Diver Training College is very much an all year facility offering a very unique and special course this course has also been running since 1971 and is called The Hard Hat & Decompression Chamber Course. The course gave them the opportunity to experience a by gone era of diving history, by get the chance to use antique diving apparatus like the Siebe Gorman brass helmet which goes back some 120 years. The decompression chamber section of the course is where they dove to 50m in a controlled environment within the dive chamber. 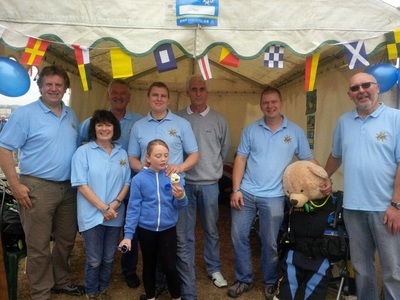 We annually attend the Medway River festival and advertise our Scuba diving club. Here we are with our friend faithful Scuba Ted teaching everyone how to safely wear the kit. 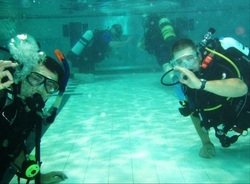 The Ocean diver Course price has been reduced for the remainder of 2013! Now only £199 a saving of £90. 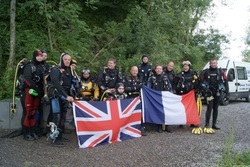 The dive club of Valenciennes (France) visited the UK for the weekend. 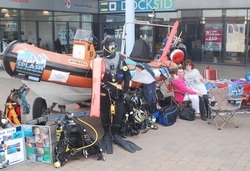 Because of bad weather Saturdays planned dives from Selsey Bill were blown out, so plan B was put into action. Off to Vobster Quay and couple of enjoyable dives were had. Then a long trip back to Selsey, for a curry and a beer or two. Sunday morning the wind changed long enough for a beach dive under Selsey Lifeboat station. Although it was a very low vis dive everyone was happy to be in the sea. On the 28th of May as part of our membership drive we spent the weekend at the Dockside outlet centre.